You can't go wrong with embroidered sweaters. Custom sweatshirts and sweaters are a familiar, comfortable wardrobe go-to for almost everyone. Promotional sweaters are extremely ubiquitous and therefore are an obvious option when you're looking for a logo garment that people will be willing to wear. ePromos' selection of custom embroidered sweaters offers something for everyone; choosing a soft, cozy sweater means you'll be certain to please even a finicky fashionista. V-neck promotional sweaters are a simple statement option for a preppy, polished look. They can be worn over a collared shirt to be elevated to a business appropriate look, or worn without a visible shirt underneath to keep things casual. 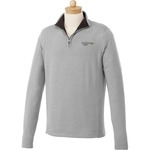 Your embroidered logo will stand out marvelously against the simple blank canvas of a v-neck sweater. As another option, ePromos offers a half-zip sweater – a casual half-way point between a V-neck and a button up sweater. This selection has a laid back, almost athletic look when unzipped but can be very professional when zipped to the fold-down collar. It's also a more unique choice for embroidered sweaters and would definitely set your staff apart from others who would be similarly dressed. No matter what style sweater you choose, ePromos offers a wide array of colors and can help you customize your apparel for the perfect giveaway, gift or uniform essential. Give us a call today!